ScareMeNots are great! Every child should have one! 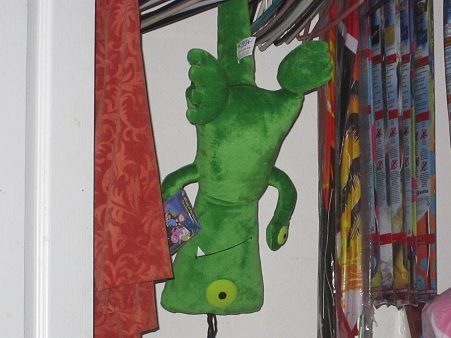 ScareMeNots are plush toys that you can hang in your closet. They look super cute in there, and they also keep kids feeling much more secure when they go to bed. A lot of kids are afraid of monsters in the closet or under the bed. Well, thats where the ScareMeNot comes in. When kids see their friend hanging there in the closet, they feel more comfortable, because they have someone keeping watch- to make sure there aren't any bad monsters lurking around. I know when I have a child, I'll want him or her to feel secure when they go to sleep. So I'll definitely have to get another ScareMeNot when the time comes. Since I don't have any kids now, I am going to give this one to my cousin Katie's little girl. I've talked to Katie, and she told me that Marisol is afraid of having monsters in her closet, and under her bed. That's why, when my cousin comes down to visit, I am going to give it to her, so she can feel more secure in her own room. Another great thing I wanted to mention, is that she can put her ScareMeNot anywhere! You can place him on the shower rod, tuck him in the bed, hang him in the closet, on a door knob, or just about anywhere else! I received "Gus." Gus is super cute! He has 3 eyes- for extra protection; And my favorite part about him, is his 4 little pieces of hair :o). It's just so cute that he only has a few pieces of hair! Until my cousin does come down, I am keeping Gus in my closet- to help keep an eye out for me :). Isn't her just adorable? There are a lot of ScareMeNots available. My other 2 favorites are Defender Dave and Fearless Fred. 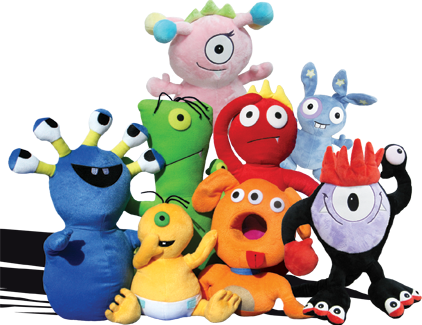 But really, all of the monsters are adorable :). There is one other great thing about ScareMeNots that I wanted to mention; They come in Big Sizes and Travel Sizes! If you have a little one at home then you should definitely consider getting a ScareMeNot! They make fun toys, friends, and protectors. 1 of you will receive a ScareMeNot of your own! Mandatory Entry: Visit the ScareMeNot website, and tell me which ScareMeNot is your favorite! ﻿﻿Disclosure: Review product is bring provided to me free of charge to ensure an honest review. All opinions expressed are my own, and were not influenced in any way. Facebook is not involved in any way. Only 1 entry PER HOUSEHOLD. Be sure to leave your email address in each comment.This giveaway will end June 13th, 2011 at 11:59pm. I <3 Guardian Gus! So stinkin' cute. I am one of your FB fans! My favorite is Deep Breath Dudley. I love these, thank you! My favorite is Courageous Carrie!! I am following ScareMeNot on Twitter. Lil Luis is tied for 2nd! I subscribe to your. Email 2. I am your friend on facebook charity l.
I entered the amazon gift cards and books giveaway. I entered the yummy and crunchy giveaway. My favorite is Courageous Carrie. Thanks. I entered the Yandy Giveaway! My favorite ScareMeNot is Valiant Valerie. I think I like Deep Breath Dudley and Courageous Carrie the best. Soooo cute, all of them really. Like Scare Me Nots on FB.